ROHM has recently announced the availability of an ultra-compact reflector-type LED optimized for consumer devices such as matrix light sources for gaming and wearables that demand increased miniaturization. 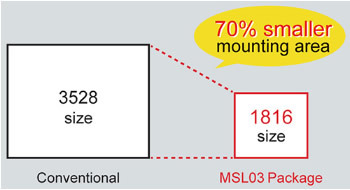 The MSL0402RGBU reflector-type 3-colour LED leverages miniaturization technology cultivated over many years to achieve the smallest size in the industry (1.8mmx1.6mm). This enables high-density mounting and provides excellent colour mixing characteristics, ensuring support for high resolution LED matrices. In order to turn on matrix light sources it is necessary to take measures against ESD. Unlike conventional solutions that utilize a Zener diode, the MSL0402RGBU adopts an element with high ESD resistance. This makes it possible to superior ESD protection without a Zener diode and prevent light emission of unnecessary blocks in matrix circuits, resulting in clearer display. In recent years, LEDs capable of representing the full colour range are expected to be widely adopted in a variety of fields, including digital signage requiring improved design flexibility. 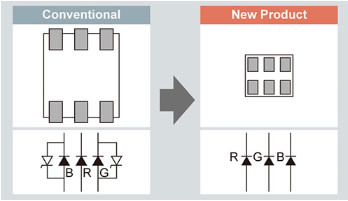 At the same time, as applications become smaller and more sophisticated the need for greater expressiveness grows, along with increased miniaturization and long-term reliability. Up to now, ROHM offers ultra-compact molded type LEDs (PICOLED®), high brightness reflector types (MSL series), and compact high brightness 3-colour LEDs with excellent colour mixing, but to meet market demands ROHM developed the industry's smallest high brightness reflector-type RGB LEDs (MSL0402RGBU). Until now, 3.5mm x 2.8mm LEDs are typically used in dot matrices, resulting in a coarse display which can be problematic when higher resolution is demanded. In response, ROHM utilizes miniaturization technology cultivated through decades of LED development to reduce mounting area by 70% over ROHM's conventional LEDs. This makes it possible to construct high brightness, ultra-high resolution matrix light sources that contribute to improved performance and display capability in many applications. The combination of silver plated frames and silicon resins used in conventional LEDs will typically result in a drop in brightness after 1 year due to 30% sulfuration caused by sulfur components in the air originating from tobacco smoke and exhaust gases, presenting problems for long-term reliability. 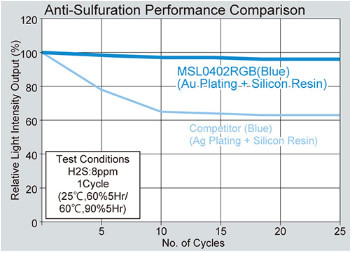 In response, the MSL0402RGBU utilizes a gold plated substrate that prevents sulfuration even when silicon resin packages are used. This minimizes brightness degradations and contributes to greater long-term application reliability. Normally, Zener diodes are used as a countermeasure to static electricity in LEDs. However, in matrix circuits this can cause current to flow to other LEDs, resulting in unwanted light emission. In contrast, the MSL0402RGBU employs a high ESD resistance element that eliminates the need for a Zener protection diode, ensuring superior display performance in matrix circuits. Click here to download the datasheet . Anglia are offering FREE samples of the MSL0402RGBU reflector-type 3-colour LED from ROHM, please fill in the form below to register interest now. 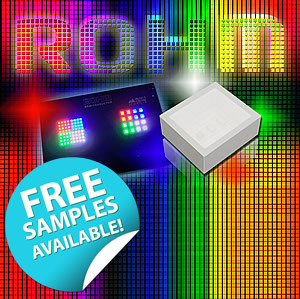 To register for FREE samples of the MSL0402RGBU reflector-type 3-colour LED from ROHM, please fill in the form below.